Secret Santa is the sixty-fourth comic issue, released 28 November, 2012 in the US. The daily delivery of the internet arrives and it includes embarrassing videos of Mom, Nixon, Calculon and Professor Farnsworth. Farnsworth realises that the blackmailer in his dream must have been real. The Planet Express staff find a number of hidden blackmail cameras and trace the signal to Neptune. The ship is disguised and the crew set to shut down Robot Santa's naughty or nice tracking system. As the alarms are activated by naughty thoughts, Zoidberg is sent to deactivate them. Unfortunately the main alarm is beyond the mess hall and he sets it off thinking about food, leading to the crew's capture. Wikky, the Neptunian in charge of the naughty list, has been blackmailing rich people in order to fund a coup. Bender text messages Santa and Wikky is sent to be a mall santa on Amazonia. For a reward, Santa gives the crew a final meal, including rum balls that damage Bender's memory, and a thirty second head start. While fleeing, Fry tries to use a computer to send for help, but accidentally sends the dark secret file to every email address on Earth. By hooking up Santa's sleigh to the Planet Express ship the crew are able to beat the signal to Earth. Farnsworth boosts Bender's reception allowing him to absorb all of the emails and prevent anyone else from getting them. Fry has the idea to feed Bender a more rum balls so that he forgets everyone's secrets. It works and Santa heads home to Neptune. Bender apparently got Santa's phone number while working for him in A Tale of Two Santas. 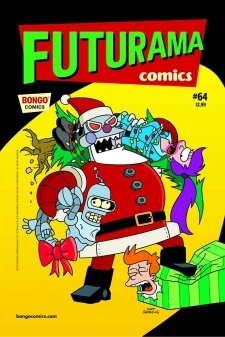 This is the second Xmas-themed issue not to be released in the UK, the first being "Robot Santa's Little Helpers". This page was last edited on 15 July 2017, at 09:08.